After more than a month out of the game, I returned to the world of Random Horror with a... not quite a bang, more of a piff! 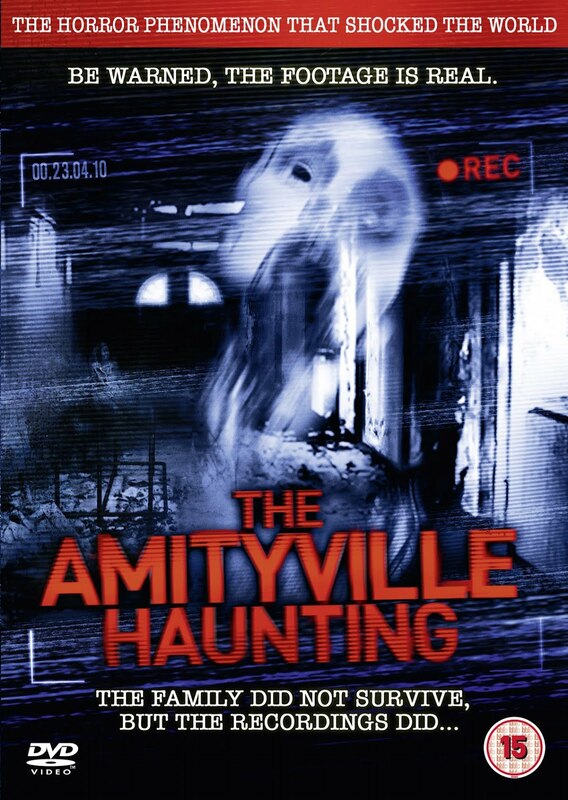 I trawled through the Amazon suggests looking for more hidden gems and what I found was The Amityville Haunting! By now, I think everyone should know the story of The Amityville House and its connected stories, for those who don’t, read about it. Anyway, The Amityville Haunting sells itself as a “Real” found footage film. The tagline reads... “The family did not survive but the recordings did”. I think this pretty much sums up the direction the film will take us. 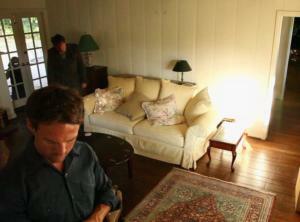 To begin, we see a group of kids filming themselves breaking into the house whilst it is empty. They fool around a bit and pretty much do what young stupid American stereotype teens do in these types of films. And, equally as stereotypical, they all meet with untimely ends! We skip forward slightly and a very awkward looking family introduce themselves to a slightly tentative realtor. With this, we are introduced to the Benson family, Douglas, Virginia and their three kids Tyler, Lori and Melanie. The whole experience is being captured by Tyler on his hand held camera. A quick scout around the house and a bit of a Luke-warm discussion between the parents and they decide to take the house. With this in their thoughts, they rush to inform the realtor only to find her lying dead in the driveway! Unperturbed, the Bensons begin their move. A few removal men get the film-maker treatment as Tyler teases them about the house being the infamous Amityville house and how it is supposedly haunted. They must be the only removal men on the planet who don’t watch films because not one of them seems to have heard of it! Before the day is done, yet another fatal accident befouls the christening of this young family’s new home. One of the removal men met his maker after falling down the stairs! By now, Virginia is beginning to regret the decision to move but Douglas’s military background starts to show and he insists they stay for at least a few more days. Further angles are added when he installs a security camera but it isn’t long before their decision to live in this fateful house bites them in the arse! So, pretty much that is the tract of this film. Slow, sometimes painfully so and poorly acted are probably the first words I would use to describe The Amityville Haunting. As a “real” film, the whole scenario and portrayal are totally unreal. Douglas as the man of the house rules with an iron fist but then still persuades the family to vacate the house in order to install an unhidden camera! Ok, perhaps but what plays out through the entire duration (86 Minutes) is a lacklustre, fairly uninteresting home movie which threatens to scare on only one occasion. In all honesty, much like the majority of the direct to video releases of the Amityville series, this film could have been called anything. Very little reference is made to the DeFeo or the Lutz families and if I’m totally honest, it might have interested me more in the long run if it had been called something like the Benson Family Haunting. I admit, I bought the film because of its connection to Amityville but all that proves is the draw of the story is still appealing to me (PR at work) but the fact that this film is connected to two of my favourite horror films is quite a saddening thought! Bad acting, no special effects of note and a story which is non-existent really don’t take too much away from what was always going to be a terrible film. Playing on the recent craze of found footage films only heightens the disaster. A Sub-Genre which has enthralled me in recent times with titles like Grave Encounters and Skew, somehow now however, films like this and Episode 50 have left a bitter taste in my mouth as the entertainment factor is sucked from them at high force! Much like the Benson family in this film though, I will not be perturbed, I will not give in. My search for good horror from all walks of life goes on. The Amityville Haunting serves as a good benchmark on which to improve upon. Certainly not the worst horror film I have seen in recent times, far from it but for anyone interested in watching this film, I leave one word...... Don’t!